Partially due to a history based on tolerance, Amsterdam is known for its acceptance of else-where-illegal recreational/medicinal drugs such as marijuana, psilocybin mushrooms, herbal ecstasy, etc. An atmosphere like this only naturally goes hand in hand with more extravagant behavior than say the prudish puritan beginnings of a country like the United States. 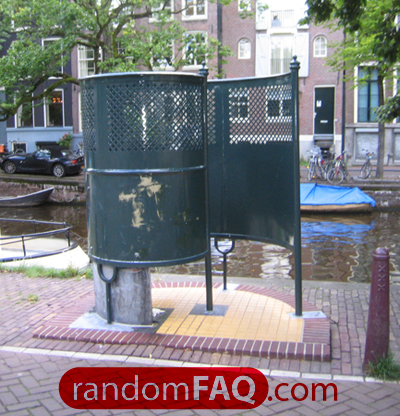 One of the major problems resulting from Holland's tolerance is public urination. Legal for some time, people finally started to become fed up with the act recently. 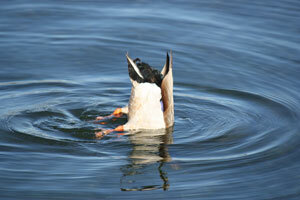 Being as common as it was, making it illegal would make no dent into solving the problem. 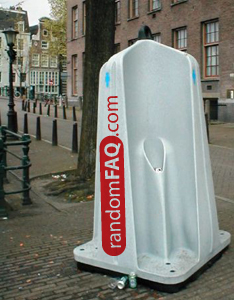 Instead, the city appeased its leakers' demands by installing urinals and stalls right out in the open on the sidewalk. Women who like privacy and a toilet seat still need to go indoors, and sometimes even have to pay to use the bathroom.